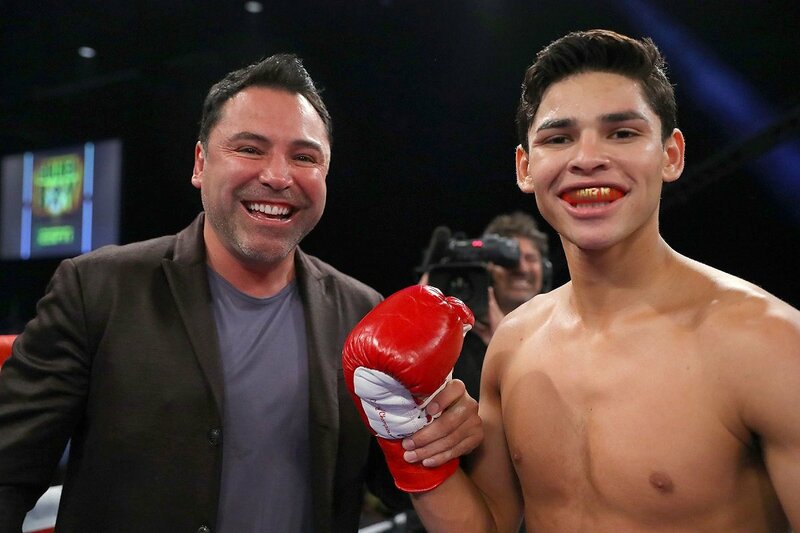 Rising sensation Ryan “The Flash” Garcia (13-0, 7 KOs) exceeded all expectations in his headlining debut as he scored an explosive first-round knockout win against Tijuana, Mexico’s Fernando Vargas (33-16-3, 24 KOs) to defend his Junior NABF Super Featherweight Title in the main event of the March 22 edition of Golden Boy Boxing on ESPN and in front of a sold-out crowd of 1,807 boxing fans at Fantasy Springs Resort Casino in Indio, Calif. After calmly measuring Vargas for most of the first round, the pride of Victorville, Calif. landed a three-punch combination that finished Vargas at 2:55 of the same round. In tonight’s co-main event, Eddie “Eboy” Gomez (20-3, 12 KOs) of The Bronx, N.Y. knocked out KeAndre “The Truth” Gibson (18-2-1, 7 KOs) of St. Louis, Mo in the second round of a welterweight fight originally scheduled for 10 rounds. Gomez landed a powerful counter right hand that stiffened and dropped Gibson, who was no longer allowed to continue at :54 of the second round. Irish welterweight prospect Aaron “Silencer” McKenna (2-0, 1 KO) blasted Jose Palacios (1-2, 1 KO) of Chihuahua, Mexico via knockout in the first round of a scheduled four-round super welterweight fight in tonight’s televised swing bout. Featherweight contender Joet Gonzalez (19-0, 11 KOs) of Glendora, Calif. scored a fifth-round knockout victory against Rolando Magbanua (26-7, 18 KOs) of Cotabato, Philippines. Though the fight was originally scheduled ten rounds, Gonzalez’s power was too much for Magbanua, who was stopped at 2:06 of the fifth round. Raul “El Cugar” Curiel (3-0, 2 KOs) scored a second-round knockout victory against Quantavious Green (1-2, 1 KO) of Shreveport, LA. After Curiel dropped Green twice with body shots, the fight was stopped at 1:29 of the second round. In a surprising upset victory, Filipino pugilist Eugene Lagos (13-5-2, 8 KOs) scored a one-punch knockout victory against Pacoima, Calif.’s Emilio “The Kid” Sanchez (16-1, 11 KOs) at :35 of the second round of a scheduled eight-round super bantamweight fight. Jonathan “Thunder” Navarro (13-0, 7 KOs) of East Los Angeles, Calif. scored a TKO victory at 2:58 of the second round of a scheduled eight-round welterweight fight against Gabriel Gutierrez (5-7, 3 KOs) of El Paso, Texas. Garcia vs. Vargas was 10-round fight for the Junior NABF Featherweight Title presented by Golden Boy Promotions. The event was sponsored by Tecate, “THE OFFICIAL BEER OF BOXING” and Hennessy, “Never Stop, Never Settle.” The fights took place on Thursday, March 22, 2018 at Fantasy Springs Resort Casino.